…being too smart is no excuse for missing out on the chance of a lifetime. It was the summer of 1994, and I was desperately looking for an adventure to fill the long July 4th weekend. I was new and late to the rock climbing obsession having started only two years earlier at the age of 30, but I had it bad. And, as far as obsessions go, this was more like an addiction. Sure I liked it, but more to the point, I had to have it. I was living in the Lincoln Park area on the north side of Chicago and was earning my climbing stripes in Baraboo, WI at the Devil’s Lake Bluffs and at the Mississippi Palisades State Park near Savana, IL. These climbing areas were 3 hours away from Chicago, so rock climbing was a weekend-only affair. And with wet weather haunting so many of the warm-enough days in that part of the country, I averaged only a few days a month. Constantly suffering from withdrawals, I regularly resorted to bouldering on the stone structures in Lincoln Park just to take the edge off. My favorite was the black (dirty?) stone structure housing the statue of Ulysses S. Grant (see more recent photo); it had a few surprisingly good routes, all about twice my height. For the 4th of July, the obvious answer to the question of “what to do?” was to go to Colorado again. And the hardest, biggest, baddest climb I’d heard of in Colorado was The Diamond. 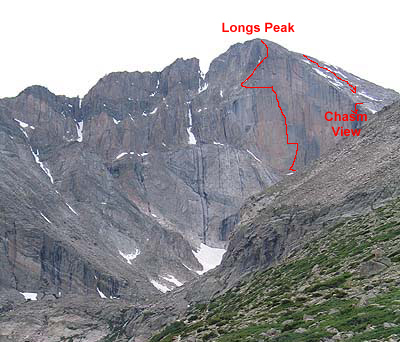 The Diamond is the sheer and prominent east face of Longs Peak and named for the shape of the cliff. The face has a veritcal gain of more than 900 feet all above an elevation of 13,000 feet. It is a world famous "big wall". 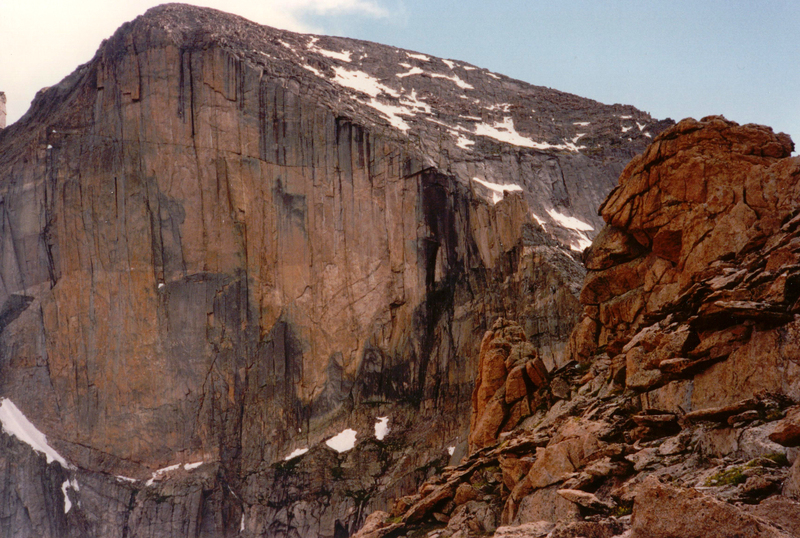 The easiest route on the face, the Casual Route (5.10-), was first climbed in 1977. I learned about The Diamond during my two previous visits to the Colorado Mountain School (CMC) in Estes Park, CO. My instructors/ guides (Mike Caldwell, the dad of the famous climbing Caldwell, Tommy, and Topher Donahue, the son of the CMC Founder) led me & my pals up graduation climbs in RMNP (Sharktooth [5.6], Petite Grepon [5.8]), which always had that wonderful sense of being the absolute limit of human capability. 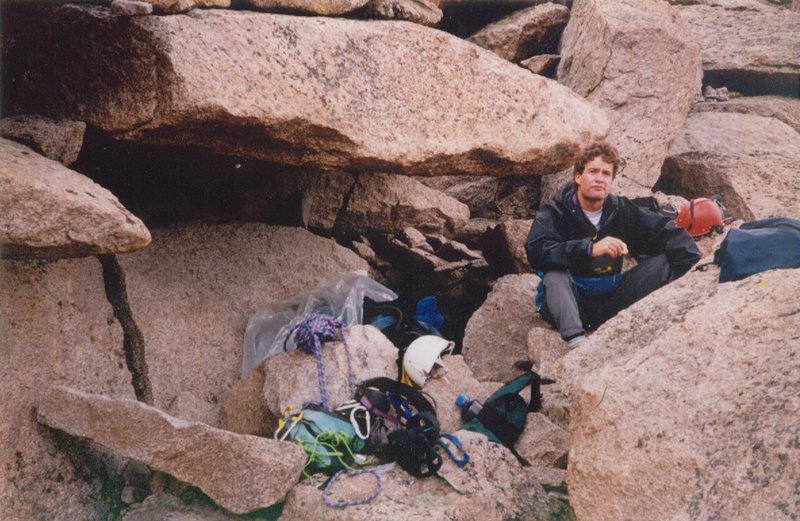 These fantastic “near death experiences” always led to discussions of “what was the hardest” RMNP rock to climb; the answer was always The Diamond on Longs Peak. My Midwest climbing pals, whom I’d met at the Colorado Mountain School, would scare each other regularly with threats of “signing up for The Diamond”. We had a shared sense that The Diamond was just out of our reach where failure felt deadly. Looking back, I think “The Diamond” served as our inspiration for improving our skills, both physical and mental. We didn’t dare do easy (for us) climbs when we might be forced, through peer pressure, to climb the Diamond at some point in our near future. Joe, Mark & Jim at the Mississippi Palisades and on the summit of The Sharkstooth. I suppose I didn’t really think I was ready. I just couldn’t think of anything else to do that would be hard and scary enough to feel like an adventure, even just in the attempt. Not knowing very much was part of the problem, or, perhaps, the key to the solution. Perhaps it was unreasonable, but I was going to do it and I wanted my buddies to join me. I put the word out, but each had the plausible yet lame excuse of having July 4th plans already. Shocked and amazed into poor debate form, my feable attempts at guy-reason got me nowhere. Looking back, I suppose they were a bit smarter than me; but I’ll still argue that being too smart is no excuse for missing out on the chance of a lifetime. Nothing was going to keep me from taking that step, even if I had to do it alone. So, determined to proceed and with credit card in hand, I placed a call to the CMC to hire a guide to take me up. I was really going to do it. Or not. After all that buildup, no guides were available for the only weekend of the year I could make work. Noooooo! …that is, unless something changed. And a couple weeks later, the situation changed. It was about noon on Thursday, June 29th, the 2nd to last day of work before the start of the long holiday weekend, when my cell phone buzzed. It was Topher Donahue, one of the guides I knew at CMC, with some unexpected news; he’d come available for Saturday, July 1st if I still wanted to climb the Diamond. Now all I had to do was get there in time. I had to meet Topher at 1pm on Friday, June 30th, which was only 24 hours hence. The easy thing to do was fly, but I had a company car with paid gas. It didn’t feel like I had a choice. From a previous trip, I knew the 1100 mile drive from Lincoln Park to Estes Park, CO would take approx. 17 hours driving straight through. And I still needed to get home and pack. Well, don’t tell my boss, but my 1994 July 4th holiday started about 30 hours early. The long drive from Lincoln Park to Estes Park. As I drove home, I knew the plan would come off much better with a co-pilot. I prepared my case by getting a reservation for a tiny bed and breakfast in Boulder called The Briar Rose. My pitch was that trip was going to be a wonderfully romantic Colorado getaway, during which time I would do only one climb. My girlfriend bought it. By 7pm, we were heading out I-290 west. At first, the excitement of the adventure made the driving fun. But, seventeen hours is a long time when waiting for each of 61,200 seconds to pass. I really did try to sleep in the back seat for a few of those hours. But no way; my racing mind never let me doze off for a moment. As I tried to sleep, my mind hit on the biggest problem of all: I was not going to get much acclimatization. During the initial 24 hour period, I would ascend from Chicago (600′) to Estes Park (7500′), and, then would continue the ascent, first to the Longs Peak Ranger Station (9500′), then to The Camel (~13000′). Then, after another opportunity for sleep, we would climb to the Longs Peak summit (14259′) for a total of nearly 14k feet of elevation gain in 48 hours … not what the experts recommend. I figured all I could do is try; I’d go up as far as I could and feel proud for daring much and trying hard. The more I thought about how badly I needed sleep, the further away the chance for sleep ran. It is terrible to not be able to fall asleep, but it is agony to have to stay awake. I just hoped I could make it to dawn; I figured sunlight would ease the struggle. But when the sun came up, I was in Nebraska, which is not what you’d call an interesting place to view from the highway. But after a few more hours of suffering, I could see the mountains. And the blood started to flow again. And then we were in the mountains. And the adrenaline started to pump. And then we were there, driving up Big Thompson Ave and then turning south onto Moraine Ave and then north onto Davis Street and, finally, pulling into the dirt parking lot of the Colorado Mountain School. And it was done: 1100 miles and 5 bathroom stops in seventeen hours. I signed in at the Colorado Mountain School and then went through my gear with Topher to make sure I had what I needed…I had enough gear to attempt Everest. After dumping most of what I brought, we set off for the Longs Peak Ranger Station. Since Topher was planning to stay at the Boulderfield for an extra day of climbing, the plan was for my girlfriend to pick me up at the trailhead after the climb on Sunday. And this is where things really started to fall apart. Based on Topher’s advice, I told my girlfriend that she should ask someone “official” for directions and then pick me up at 6pm on Saturday. What could go wrong? Without another thought, Topher and I took off for the trailhead and then we were quickly making our way up the trail. I had no sleep and no acclimatization. But I was scared to death, and that made all the difference. We used the standard trail, as best I could tell until we reached a junction to “Jim’s Grove”. Topher suggested we go that way to save some distance. I continued following and hoped we’d also save some elevation somehow; my pack felt like 100 pounds. Topher sitting in The Camel bivy shortly after arrival. Note the shelter provided by the overhanging rock. We reached the Boulderfield around 5pm, just as I was running out of steam. I was thankful to be done for the day, but Topher looked up toward a peak above us (Mt. Lady Washington) and pointed to a rock formation on the ridge line called “The Camel”. He indicated that we would sleep on the far side of that formation, in a comfortable and dry bivy spot. Topher had been talking about the importance of doing everything quickly and efficiently on the Diamond. My plodding approach made me worry about Topher thinking I couldn’t do the climb, and leading him to bail on the effort. I tried to look strong. Another 30 minutes and we were there; 3.5 hours from the Ranger Station. It was as nice as Topher promised. I chugged down a 1/2 liter of Gatorade (1/4 of my water supply), then felt ill for about 10 seconds before spraying my guts all over the rocks in front of me. At first glance, I could see my vomit was blood, and that made sense given how badly I felt. But on second glance, I could see that it was just my red colored Gatorade. Topher asked if I had ever had Mountain Sickness before; I went with the ignorance angle and responded with a “what is Mountain Sickness?” Now I was really worried that Topher might bail on me, so I put on my best brave-face and busied myself soaking up (and photographing) my first up-close view of the Diamond. It looked like nothing I had ever climbed. Heck, it looked like nothing I’d ever seen. A bit later, Topher asked with a knowing look if I could eat some dinner. I didn’t know that I wasn’t supposed to be hungry; all I knew was that I was starting to feel better and I was very, very hungry. There is nothing like starvation for making a meal taste delicious, even a freeze dried one. At last light on Friday, Topher mentioned that the weather wasn’t looking good, but hoped it would clear by dawn. I didn’t know what to think, but didn’t struggle long. I was exhausted. My brain pulled the plug and I was unconscious for the next 8 hours. It was my first bivy above 12,000′, and only my second bivy anywhere without a tent. At first light on Saturday, around 5:00am, Topher woke me with a “the weather is bad” announcement. I open my eyes and see wet rock and fast moving, low-level clouds not too far above. Topher suggested we call it quits and head down to climb at Lumpy Ridge. He promised to make it an interesting day still. I explained that I had worked pretty hard to get to the Diamond and wanted to take every chance to climb on it. I declared I want to stay. Topher went on to explain that The Diamond is a particularly bad place from which to bail. He explained that climbers have to rappel down two pitches more than they climbed (if starting from Chasm View), and then they have to climb back up to the Boulderfield to collect their gear. He asked if I was certain I wanted to pass on a sure thing. I did not waiver. Topher then indicated that our only hope was to wait an hour and let the bad weather clear, if it would. In my entire life to that point, I had never argued against another hour of sleep. I rolled over and took it. Two seconds later (it feels like), Topher woke me again. The sky looked the same. He announced that the weather hadn’t improved, but we could head over to the Chasm View and see if the weather had improved at all by the time we had to commit. I agreed. I ate a Powerbar and finished my water supply. Then we packed the rock gear and started over to the Chasm View. I told Topher that I needed to get some water; he said we can “get some in the Boulderfield”. I didn’t know where that was but felt reassured that getting water would not be a problem. The slightly downhill traverse to the Chase View went by quickly. And, in that brief period of time, the weather started looking a bit better. Topher futilely gave me one last opportunity to bail, and then we started down the rappels to Broadway ledge. We started late enough that everything was well lit, and the poor weather had chased off all the other climbers. We quickly finished the rappels down Chasm View to the Broadway Ledge and completed the traverse over to the start of the Casual Route. The climb started up some easy terrain which let me continue to believe (read: hope) that the 5.10 rating was intended to scare beginners away even though the climber is really easy. Climbers doing a hard route and showing the steepness of The Diamond face. My illusions were shattered by a hard crack followed by a horrifying traverse. The fantasy of easy climbing was utterly destroyed. 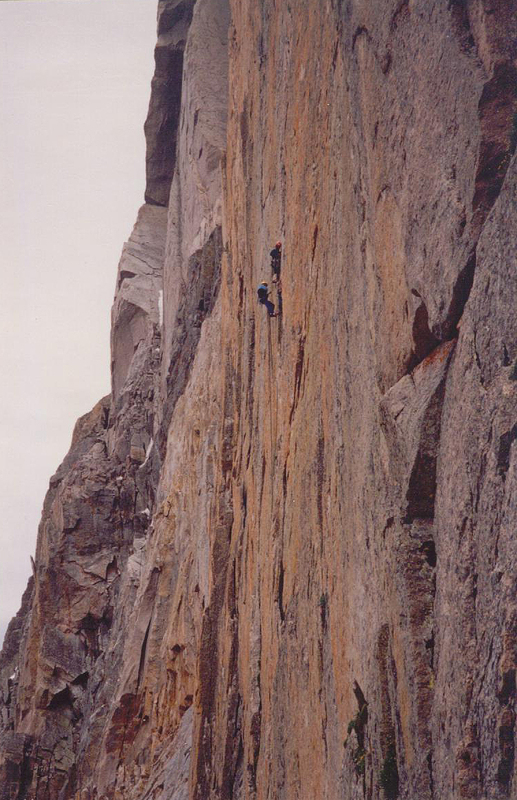 I’d done one traverse before in my life (final pitch of Pear Buttress), and that one scared the fool out of me as well. The lack of overhead protection meant I would take a long whipper if I fell. My increasing fear pushed me into some sort of zone where I don’t notice anything except the climbing. 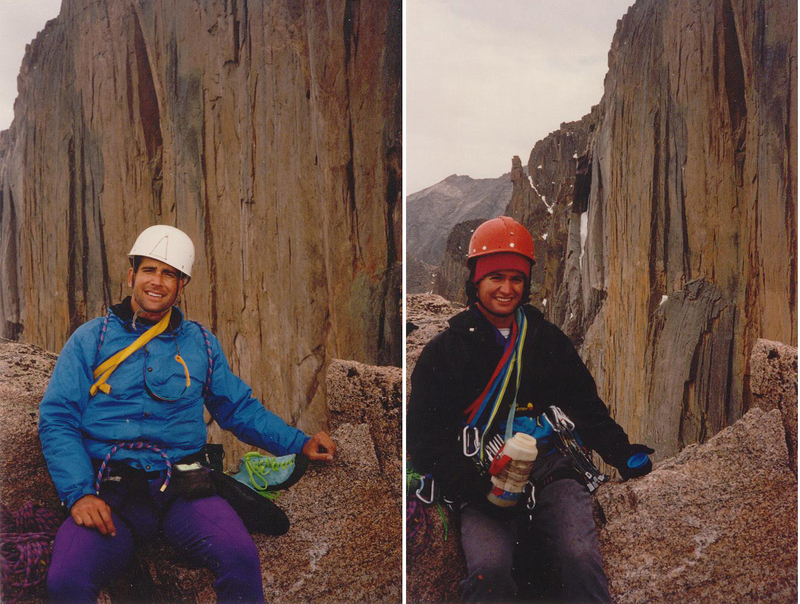 My climbing skills became preternaturally sharp; I climbed better than I ever did in my life. I had to. I was introduced to the joys (do not fail to note the sarcasm here) of squeeze chimneys 1000′ off the deck. The climbing moderated enough to keep me from vomiting as I made my way to the belay in a snowy inset. By the time I reach the top of the 4th pitch, I was relaxed enough to notice some details beyond mere rock and climbing technique. One detail I noticed was Topher’s rather thin anchor: a tricam and 2 nuts. I was used to top-rope anchors with 6-8 solid pieces using several feet of webbing that could hold a falling Boeing 747. While I was confidentTopher knew his stuff, my stress-level moved back up another notch. More hard climbing went by in a blur. When we reached the Yellow Wall Bivy ledge at the top of pitch 6, Topher suggested a quick break for lunch. And that’s when it dawned on me that I never refilled my water bottle. With my desiccated mummy-mouth, there was no way to eat a Powerbar and live (remind me to tell you about an attempt to do so during a triathlon). Fortunately, I also brought an orange, which I ate with such relish I didn’t waste a drop of fluid; and, I thought hard about eating the skin as well. And, for whatever reason, despite every negative influence, I felt good. I actually started to think I would really make it. More hard climbing led to another squeeze chimney near the top. This one was a killer squeeze, as I had a pack on. I had to work my way out of the chimney and face face the remain few feet to reach the final move: a bulge with a single finger-lock hold. I pulled up on the finger-lock and found nothing above to haul on and no feet; I lowered myself back down. Topher, at the anchor only 2 feet away, tells me this is the crux. After trying in vain using a few different holds, I finally broke down and asked Topher for advice. He said “you figure it out,” and then went on to say that he could not believe that I made it the entire climb without a fall only to fail here. But after a moment, he took pity on me and offered a nugget: “use the knob on the right to stem”. But I couldn’t make it work so I decide to summon my remaining strength and did a lay-back using the crack on the left. I made it. I actually stole a moment to be proud of myself for getting past the crux. But we weren’t done yet. One last pitch; a traverse, crap. Topher told me to lead as it would be safer in case I fell. (Assuming I know how to place gear!) I’d never led anything in my life; my first lead would be on The Diamond! It turned out that I only had to clip a couple pins, but the sharp end of the rope felt electric. And then I was on easy ground. I’d made it. I had actually climbed the Diamond. I felt my life would never be the same (it wasn’t). I belayed Topher to my ledge and then we scrambled a short distance up and left and then up and right a longer distance to reach and step around a corner that led to talus above the Diamond but below the summit. After a couple hundred feet of scrambling we were sitting on the summit of Longs Peak…my first Colorado 14er summit. Sitting on the summit of Longs Peak, I thanked Topher for a great climb. To my great surprise, he told me that I was his first guided client on The Diamond. It was yet another first for me, in an odd way. As the adrenaline started to wear off, I started to feel tired. We sat to organize the gear, but since I had no water and only an orange to eat since dawn, a long stay wasn’t in the cards. Topher led me down to the Cable Route area where we descended via rappel to the Chasm View area to complete a circuit begun 8 hours before. On the way down I took a photo of some climbers that showed the steepness of the climbing. I intended to make full use of my bragging rights. Once we arrived at Chasm View, I insisted on some photos including posed shots before we scrambled back to The Camel to collect gear. I thanked Topher again and asked for directions to the water supply. He pointed down to the Boulderfield and said to ‘follow my ears’ to find access to the water running beneath the big blocks of rock. Then we parted ways. The lack of food and water (and altitude?) started to hit me pretty hard. I hadn’t had any water or food aside from an orange in 9 hours, and I had only consumed 2 liters of water in the last 28 hours. And all of this on top of gaining 14k feet in elevation in a short time, vomiting, and climbing 1000′ of hard rock. (Thankfully I was still young). After a bit of following water noises, I finally found a gap in the rocks and collected a liter of the wet stuff, which I had to put away to let the iodine pills dissolve. Using and waiting for iodine pills was another first for me; it was not the last time I’d have to suffer and wait. Once I started hiking down the trail, I felt strangely exhilarated. Even though I was around other people and walking on or near a well established trail, it was the first time I had ever been in the “backcountry” without other people I knew. I felt very isolated, and I liked it. Taking in the sights, snapping photos, and watching with real interest the exploits of the local marmots, I just floated down the trail. I felt great once more. Everything was good. I followed the trail signs until I reached the trail junction for Chasm Lake. I couldn’t wait any longer for water, so I stopped and ate my last Powerbar and finished my water while admiring the spectacular views of Longs Peak. I decided it was the greatest peak in the world and that I really needed to come back someday to climb it without a guide (I did so in 1998; see The Casual Route?). I continued down the trail and reached the Ranger Station ahead of schedule. I was going to have to wait an hour for my 6pm ride, but that was okay. Nothing could spoil my great mood, I thought. Around 5:30pm, the weather turned ugly. The wind picked up and rain and hail/snow started beating on me. I tried to get into the Ranger Station, but it was locked. I put on all my clothes and huddled in the roofed map alcove to hide as well as I could. I was freezing. And, then, my ride was late. By 8pm, I was truly miserable. Wet & cold with only poor shelter from the wind, I knew that my girlfriend was lost and that I was screwed. As I played out the scenarios in my head, I couldn’t see a good outcome. If she couldn’t find me in the daylight with whatever directions she had gotten, how was she going to figure it out before morning? No more light to see by and no one to ask for help; oh, I was definitely screwed. Out of the gloom, a couple walked past me, on the way to their car. After a polite WTF question, I explained my reasons for riding out the storm. They offered to give me a ride to town, but I declined. I didn’t have any place to go in Estes Park. I needed to get to Boulder, but I couldn’t even go there without getting word to my girlfriend. And I had no way to get any word to her; I was royally screwed. A few minutes later, as the couple drove past, they paused to make one last offer before abandoning me to the elements. I decided I would be better served by having no where to go in Estes Park than being stuck out in the open in the middle of nowhere. I accepted. I piled my stuff and body into the couple’s car and buckled my seatbelt, and then a pair of headlights approached. It was my ride. And was she pissed. While we drove to Boulder, she explained how mad she was about having to drive all over creation, etc., etc. I said that I was sorry for her troubles, but that since I had to sit for 3 hours in wind, rain & hail I probably had the worst of it, and my vote was that we should call it even and drop it. Uncharacteristically, she agreed. I must have looked pretty bad. While sitting in the car and thawing out, I wondered what my climbing buddies would think and how they’d react. I wondered when they would decide to climb The Diamond. But as I feared for myself, sometimes the chance to take a particular road less traveled only comes once, and an opportunity missed is an opportunity lost. This entry was posted on December 30, 2009 at 10:40 pm and is filed under 14ers, Alpine Rock, Trip Reports. You can follow any responses to this entry through the RSS 2.0 feed. You can leave a response, or trackback from your own site.